The utilization of geogrid for roadbed construction allows prolonging the service life of road surface, prevents ruts formation and improves technical specifications of a road. PROTECT geogrid is designed for building permanent access roads as well as for construction of trail roads, for creating transport infrastructure near construction site or warehouse facilities, for the ground reinforcement of areas intended for storing heavy loads or shipping containers. 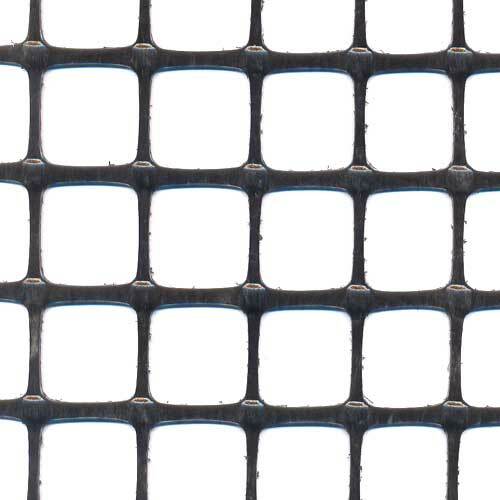 We offer road geogrid made of polypropylene with 33 mm x 33 mm cells. It is rot-proof, corrosion and decay resistant. It reduces the need for crushed stone by 40%. The application of geogrid allows increasing the time between repairs of road surface. Therefore costs of road maintenance are reduced. Here is the principle of operation of geogrid: it prevents particles of crushed stone, which is the most common material for road construction, from sinking in soft ground. Small stones become stuck in geogrid openings – they remain immovable, adding to the stability of roadbed. Road geogrid not only reinforces the ground under a road, a temporary driveway or a parking lot, but also saves materials at the expense of reduced thickness of underlayer. The following example convincingly demonstrates how geogrid works. Guidelines for application of geogrid and bulk materials. Application: geogrid must be rolled out on the compacted even ground and pinned to it with anchors. If the covered area is quite wide, geogrid edges can be fixed with overlapping. Bulk material must be evenly distributed over the surface of geogrid. While leveling crushed stone over geogrid, heavy machinery is not allowed to run directly over plastic geogrid. Machinery must move over the area which has already been covered with bulk material. It is highly advised to avoid looseness of geogrid, as it can reduce the expected quality.